I have been working on a few things the last couple of days. I am hoping to do some updates on the shop in the next couple of days. Here is a yarn that I am particularly proud of. This is 49 yards of thick/thin yarn. 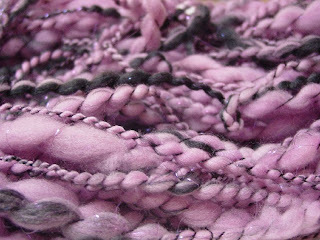 It was made with purple merino and black corriedale that was carded together with lots of purple glitz. 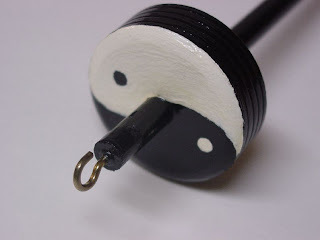 Then it was plied with a black thread. 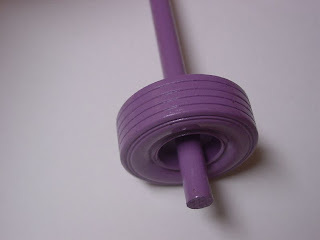 Then this is a spindle that I had been working on in my spare time. It was all good until I got to the polyurethane coat. Turns out the slight tinge is very noticeable on the white paint. It's never shown up before because I have always used colored paints. I guess it will probably sit around the house until I decide what to do with it. I don't know if it is terribly visible in this shot but most of the yellowing is in the area near the center. Its a little like the sealer pooled towards the middle or something. I liked the idea and hate that its no good now. I should rephrase that. It is good and capable of spinning, its a cosmetic defect that bothers me. 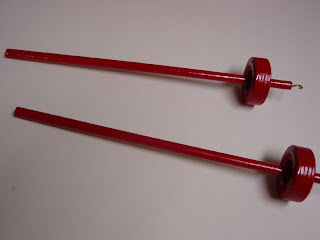 Lastly, here are a few spindles I am working on. One of the red top whorls and the lavender bottom whorl is for a custom request. Finally, Remember to give thanks for the things that you have, love, cherish, adore EVERY day. Being appreciative for the things in your life shouldn't be limited to one day a year. Especially not a day that is steeped in the history and symbolism of this country.